Penske & Ganassi vs. the rest? Looking at the line-up for Team Penske is mouth-watering even without considering the rest of the drivers that will start in Florida this weekend. Series championships, multiple wins and multiple Indy 500s are the hallmark of the assembled super-team. 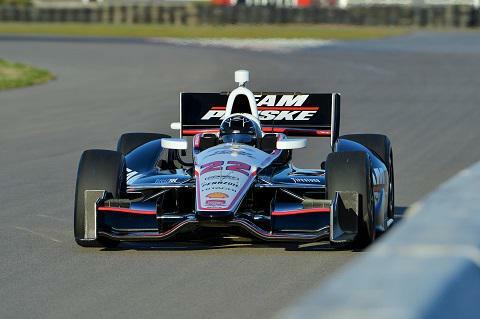 Penske and Will Power are entering a season carrying some momentum for once after shaking their Championship ‘jinx’. The release of pressure was palpable when ‘The Captain’ and his squad finally closed out a season to win in 2014. This allied to what appears – from spring testing – to be a speed advantage for the Chevrolet engine/aero packages over Honda, and you have a potent combination. Penske could easily sweep the podium on Sunday. It would be foolish of course to ignore Chip Ganassi and his squad. Despite not winning the title, they finished the strongest of all teams in 2014. After being caught napping at the start of the year, the Target team rallied from mid-season. Both Dixon and Kanaan notched up regular top 5 finishes in the closing races while Power and Penske were, depending on your perspective, limping/cruising to the finish line. Chip Ganassi was not happy with the way his team started the season last year and there is little doubt a repeat will not be acceptable. Testing form suggests they have got to grips with the Chevrolet kits and as the form team in the last races of 2014, there is a definite air of confidence from the Ganassi pit. They too could benefit from a starting advantage as Chevy’s other flag-ship team. It is not inconceivable that they and Penske could make the Firestone Fast Six a private party on Saturday. Round 1 of the match up between these two teams will be worth the admission fee alone in St. Petersburg. From the two-day aero testing at NOLA Honda teams look like they have some work to do. Making predictions based on testing is a risky game however Honda’s leading teams were broadly three to five tenths of a second off the pace. When we consider that the top 20 cars at NOLA, on lap time, were covered by less than a second, that is a sizeable gap. Honda’s teams are on the back foot for the season opener. Whilst the split of cars is almost 50/50 between the manufacturers, Honda lack the technical feedback from the multiple leading teams that Chevy will enjoy. Outside of Andretti Autosport, their teams are typically 1-2 car squads. Whilst they are not in as bad shape as their colleagues in F1 and the reality of a race weekend is radically different from testing, Honda has some work to do this weekend. Publicly at least the next big US hope Sage Karam has a deal for one race only. For a young rookie it is always difficult to temper the desire to do well and show your speed, with the need to learn and impress with a calm, mature application. Chip Ganassi is not in the habit of giving young drivers one race to impress and ditching them promptly. Equally he will not stand on ceremony waiting for a driver to get up to speed and Karam’s heavy shunt in testing at NOLA was not the best start for a rookie short on seat time. This weekend Karem will need to find that fine line between impressing on speed and race craft, and getting maximum seat time to demonstrate his ability to feedback and adapt. The other most interesting single race deal is for Simona de Silvestro. Running for Andretti this weekend, the Swiss driver is someone I am pleased to see back in the fold because she is a genuine racer. With two top 10 finishes in St Petersburg under her belt and greater familiarity with the basic DW12 package, she is better placed to score a result that could open up more races this season than Karam. Her form in 2013 where she recorded seven top 10 finishes and two top 5s demonstrates how deserving she is of her place in the series, irrespective of gender. I’ve got a hunch she could embarrass Marco Andretti and Carols Munoz if things go her way this weekend. They are here – whether you like or loathe them – and are going to be around for a while. I’ve long been an opponent of the concept, never fully understanding the fixation with changes that potentially risk the core appeal of the series for the sake of tying fickle manufacturers to the series and slightly differentiating the cars. My concerns can be distilled down to two points: the impact on overtaking; and the impact on smaller teams. With aero kits comes greater focus on aerodynamic grip. Great for the drivers who are loving the increased down force but with that comes the issue of a much more turbulent wake behind each car. Those who have watched the aero-driven world of F1 will understand how much it can compromise a driver’s ability to stay close enough to even attempt a pass. To compromise the over taking that has made IndyCar so exhilarating to watch (and a welcome antidote to F1 for open-wheel fans) would be a travesty. Another great selling point of the series has been the ability of the smaller teams to give the big boys a bloody nose. Aero kits enhance the complexity of the engineering challenge, putting pressure on the smaller teams with less resources. At a basic level, a single car team will lack massive amounts of data relative to the three and four car behemoths of Penske, Ganassi and Andretti. The times when Schmidt Peterson, AJ Foyt Racing and Bryan Herta Autosport were mixing it legitimately with the leading teams have been such a wonderfully rare (in top level racing) occurrence and therefore a valuable commodity. I really hope we don’t lose either.